Iowa is experiencing a housing crisis. The situation varies from community to community – but has one thing in common. 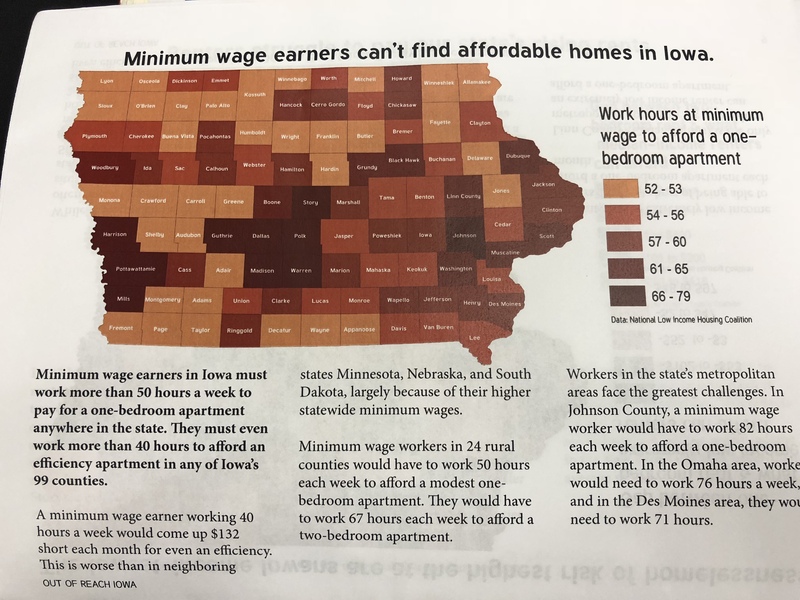 Many Iowans struggle to pay their rent or mortgage every month because incomes are not keeping up with rising housing costs. In urban communities, there is a huge demand for more affordable dwellings, yet experts say that for every 100 families that need income-scaled housing, there are only about 30 units available. In fact, Iowa is actually losing units more quickly than the units are being replaced. This severe lack of housing is impeding economic growth. Rural communities struggle to offer workers places to live and there are no developers coming to town offering to build new housing. Companies that would like to locate in a particular town are starting to ask city leaders the question, “Where will our employees live?” It’s a valid question. Can we really expect low-wage workers to travel more than an hour each way to work – just because there are no affordable dwellings near their place of employment? We need political and community leadership to bring more affordable housing to our citizens. If I am elected to the Iowa Senate, I will work with anyone who is serious about solving this problem and will look for best practices from all over the country that we can emulate here.